You may not have heard of Thunder Force. 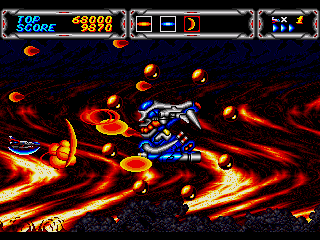 The metal-infused shoot 'em up spawn of cult Japanese developer Technosoft scored a series of direct hits for devoted Sega Genesis fans and their Mega Drive owning Eurotrash counterparts back in the nineties, but the fickle tides of the games industry would soon lead to Technosoft's grizzly demise of less than a decade later. Before its untimely end, Thunder Force spent seventeen years breaking out from its humble microcomputer origins to become one of the most beloved and insanely over-the-top series of the 16-bit era, throbbing with beautiful parallax graphics, punishing difficulty and unrestrained synth-rock accompaniment. Thunder Force survived the faliure of Sega's Saturn console to bounce back with a mooted Dreamcast offering, but both developer and console punched out in late 2001. Lost Levels showcases a series you might have overlooked, and picks through the ashes to examine what remains of the lost sequel, Thunder Force VI. 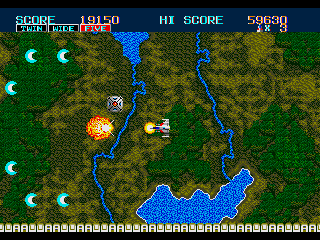 The series started with the Japan-only release of Thunder Force in 1983, a game owing a clear debt to Namco's Xevious in both gameplay and aesthetic. Targets are engaged in the air and on the ground with your ship's lasers and bombs as players swoop over the geometric golf-course standing in for the massive super-dreadnought outlined in the sketchy plot. Thunder Force staked out its own path by introducing 8-way scrolling in place of a horizonal rail, but it did not rock or even aspire to rock - in game "music" was just a bleepy, distorted jingle. Thunder Force is now relevant to the larger series only through name and what negligable plot ties the games together. It was released only for a handful of Japanese microcomputers: the pick of the bunch was the Sharp X1 version, featuring a more expansive playing area and taking advantage of the system's advanced resolution and colour capabilities. Sadly, Japanese classic computing, emulation and ROM preservation are an arcane mystery to the western gamer, meaning an evening with Thunderforce I will amount to a few hours of fruitless fiddling with a PC-6001 mkII emulator, some swearing and the sobering realization that it probably wasn't worth your time after all. Four years passed and Technosoft decided to dust off the name and release Thunder Force II on the Sharp x68000 (Japan's answer to the Amiga) with a decent but reduced port for the more familiar Sega Mega Drive/Genesis following in 1989. In the latter capacity it formed part of the Sega system's early lineup and proved popular with early adopters, gathering positive reviews in the primordial 16-bit press . The overhead stages remained from Thunder Force, but were tempered with more traditional horizontaly scrolling stages in the style of R-Type. Thunder Force II is the place where the series started to rock out, thanks to Technosoft's trademark brand of overdriven 16-bit chip rock. Other developments included the introduction of the CRAW unit (an option-like gunpod that circles the ship, providing a degree of defense while boosting firepower) and the charmingly garbled low-sample speech that would become the series' trademarks . TFII bares more than passing resemblance to cult Genesis stablemate Herzog Zwei, and fans of that game should take the time to check out. Technosoft moved quickly to capitalise on Thunder Force II's success, and the ingeniously named Thunder Force III followed a year later in 1990. This was the game that really pushed the series forward, as well solidifying the gameplay that would hold sway for the remainder of the series. A purely horizonal affair, Thunder Force III wowed it's owners with neat graphical effects and pumping synth rock soundtrack that really psyched you up to blow a robot's face off. Thunder Force had been reborn as a truly balls-out rock god of a shooter, complete with pad-destroyingly hard difficulty on a par with it's newfound R-Type influence. 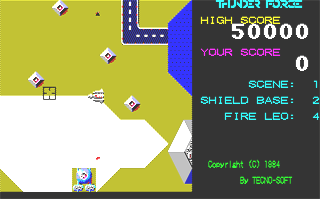 The game was popular enough to earn an arcade port, Thunder Force AC, co-published with Sega. The arcade port was ported in turn to the SNES as Thunder Spirits. Both reimaginings drop the original initeration's level select screen and swap two of the original levels for two completely new stages. 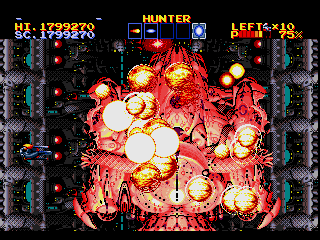 The franchise closed out the 16-bit era with Thunder Force IV in 1992, pushing the Genesis to its limits and a little too far beyond (IV's habit of slowing down to a crawl whenever an enemy unleashes bullet hell is frequent but useful). The game boasted one of the most amazingly balls-out intro sequences of the age, as the latest generation of Fire Leo attack craft swooped forward in extreme closeup over a scrolling logo and dispatched a similarly massive boss before barrel-rolling into the title screen proper. Combined with a driving synth-metal riff, it set the mood for some epic destruction (see above). Featuring incredible art assets and fantastic music, the game was and remains one of the most stunning examples of the age. The difficulty was truly punishing, but a neat easter egg allowed the player to gain 99 lives by setting "stock ships" to zero on the options screen. For reasons unknown that no doubt defy all sense and logic, the game was retitled as Lightening Force: Quest for the Darkstar [sic] in the U.S., severing ties with it's well regarded linage. In a Europe starved of quality shooters, the game did brisk business. Thunder Force V granted Saturn owners more of the same in 1997 (a PlayStation port followed soon after as Thunderforce V: Perfect System), albeit with the thin plot moved to another world, some minor tweaks made to the CRAW system and a more diverse array of ships. 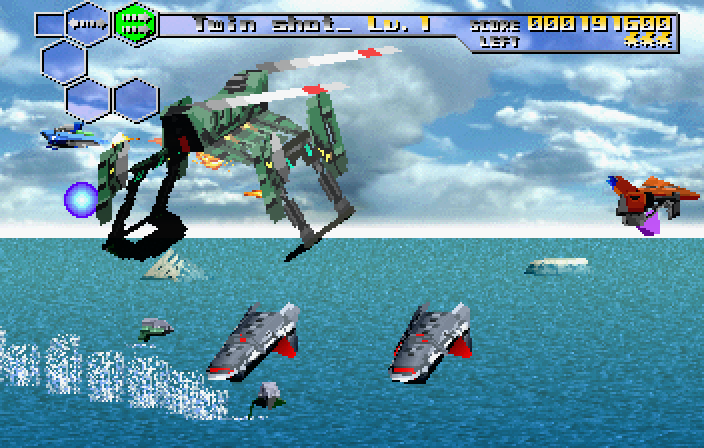 As the gaming industry moved from classic 2D genres to the rapidly developing arena of 3D and the 2D powerhouse Saturn sank beneath the waves a fan of the series couldn't help but wonder if they'd ever see a Thunderforce game again. Technosoft answered that late in 2000, when a CG intro movie for Thunder Force VI entered internet circulation, with a release slated for the doomed Sega Dreamcast. 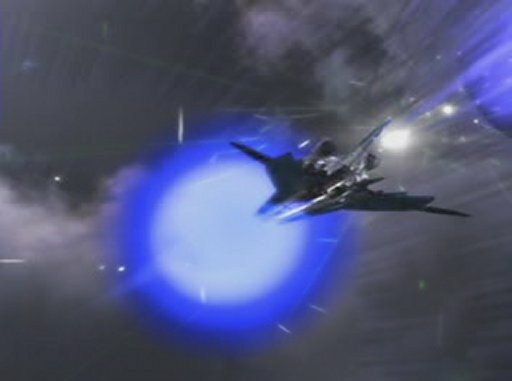 Depicting the Fire Leo ships engaging in combat, the clip gives no hint to new gameplay content beyond the usual "shoot things quickly" ethos, but embodied the cocky, driving spirit of the series to date and harked back to Thunderforce IV's gorgeous opening. No screenshots were released to the best of our knowledge, but the clip promised another strong entry in a series which had become an overlooked classic. Alas, Thunder Force VI died at about the same time as Sega euthanised the Dreamcast - Technosoft ceased to exist as a developer in 2001, and quietly integrated into a pachinko maker's R+D department. A strong 2D company had failed to thrive in the 3D age, soon to be followed by peers like Data East, Compile and (for a time) SNK. Thunder Force VI was cancelled by default. For most games this would be the end, but Thunder Force was still due for one more commercial outing. 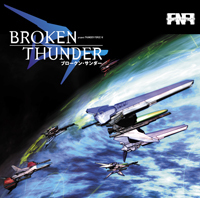 Thunder Force has always been known for its soundtracks, and Technosoft composer Tsukumo Hyakutaro had already completed the soundtrack for TFVI. It saw release as "Broken Thunder: Project Thunder Force VI" in 2001 and was put out via Hyakutaro's own company, Noise. The trademark over the top synth-metal the series was known for had lived beyond it. Internet rumour is rife that Technosoft are due to return any day and release Thunder Force VI on an unannounced system, but little or no evidence supports this beyond a footnote in a Wikipedia entry. While the existence of a polished intro movie and professional soundtrack give hope to the existence of a playable prototype, the Japanese collector scene guards it's unreleased games like the sea hoards it's dead. Any guesses as to how Thunder Force VI would have turned out will have to be made based on the tracklisting, intro movie and past form, but at least some small part has been saved: a part we can headbang out to in private.